Monday morning, and good news. 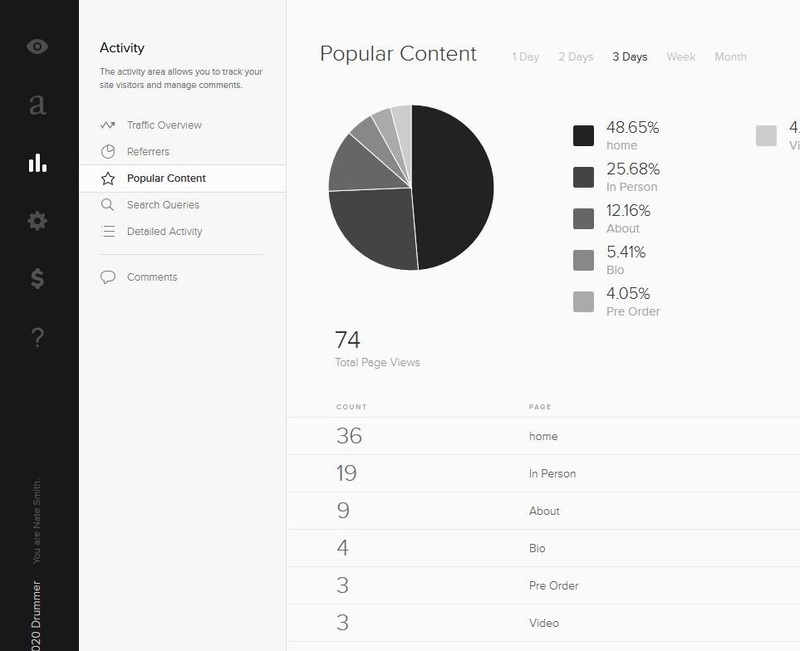 According to my stats page on Squarespace, I’ve had three clicks on the page called “pre order” in the last 3 days. That’s a page you only reach if you click “buy now for $29.99”. I’m beyond psyched, especially after wondering if the method of using paid advertising was even viable. I now need to figure out for-sure where the traffic is coming from (I have a pretty good idea), see if it scales (for instance if I spend 10x on advertising if I’ll get 10 clicks-per-day instead of 1), and do it. To review, my hairbrained idea was to use the crowd-funding model to fund the production of the 80/20 Drummer – being completely transparent to the buyers, telling them that by “pre-ordering” they’re getting a sharp savings on the eventual price – to the tune of about $1500 (the estimated production costs), which would require 69 pre-orders at $29.99 and a bit extra to cover the advertising retrospectively. I plan to use a crowd-funding site like Indiegogo or FundAnything, to side-step any legal issues involved with accepting credit card payments personally. Again, the idea being that any musician can duplicate my “success” with zero investment up-front. Here’s how the numbers look. 74 views in the last 3 days and 3 “buys” is a conversion rate of about 4.05%, which is actually excellent. I suspect that’s going to tick up, because my suspicion is most all of the traffic is coming from Google Adwords. (Facebook advertising, it turns out, is great for getting page “likes”, and traffic perusing your site, but not great for conversions. Who’s ready to buy a drum DVD? Somebody who’s googled “drum lessons”.) At any rate, my Adwords budget is currently $5-a-day, so that’s $24.99 hypothetical profit-per-customer. What will happen if I up my ad budget to $50? We’ll see. Back soon, with more news.